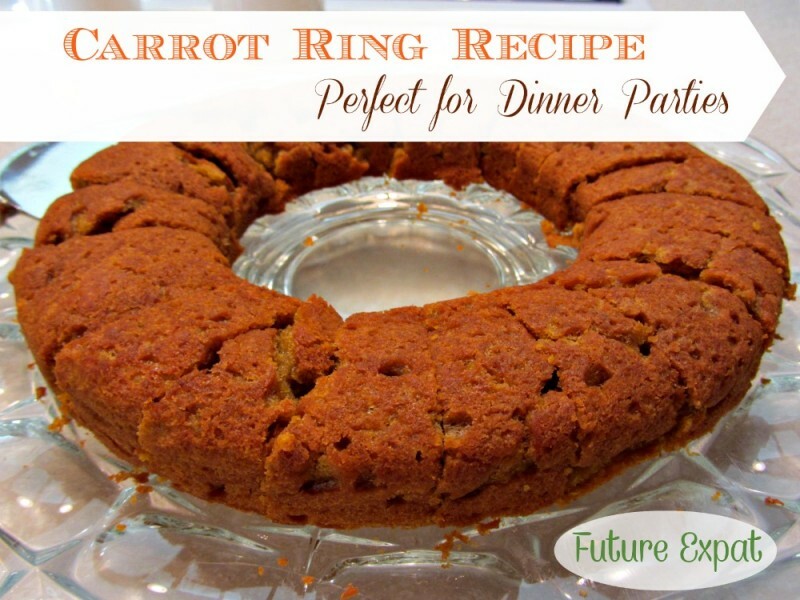 I fell in love with Carrot Ring the first time my Mom made it when I was a teenager. When I went off to college, it was one of the recipes I requested for my brand new recipe box. 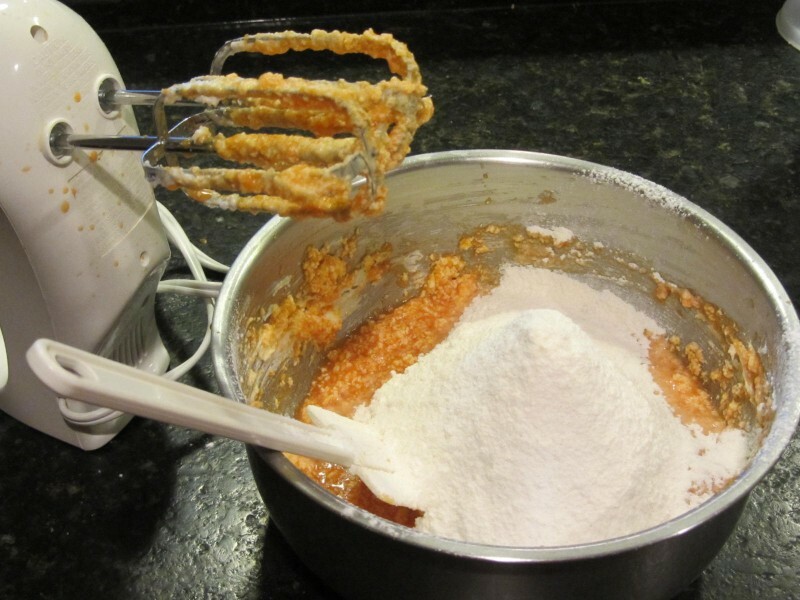 I made it for my college roommates once, but I refused to let them in the kitchen to watch me make it…it just looks really gross when you mix together the baby food carrots and shortening but haven’t yet added the flour. 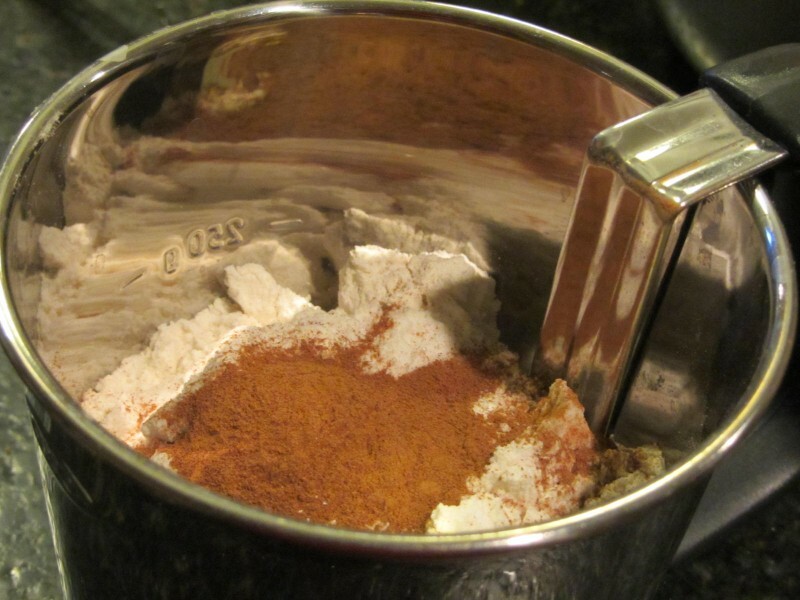 I don’t normally cook with shortening but this recipe is one that is worth it. Now that Crisco sells trans-fat free versions, I feel much better about making this tasty recipe for a special occasion. 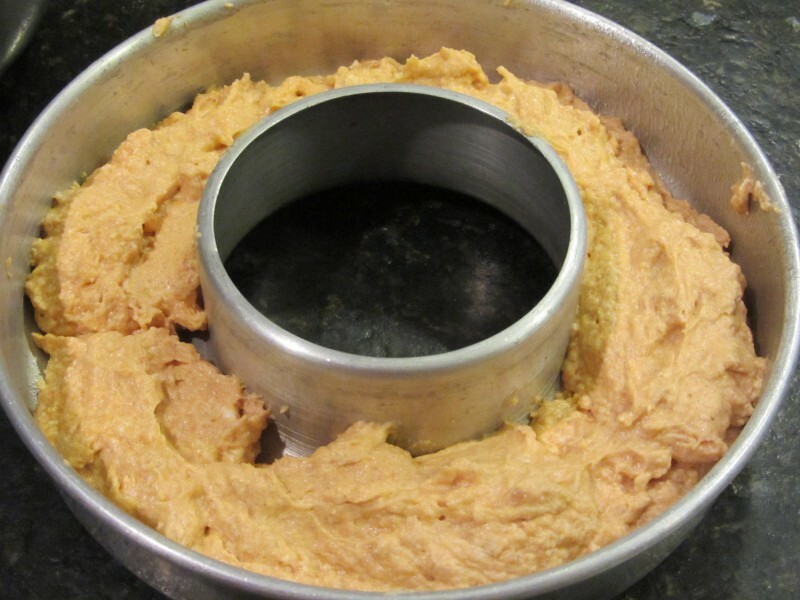 Yes, you must use baby food in this recipe. 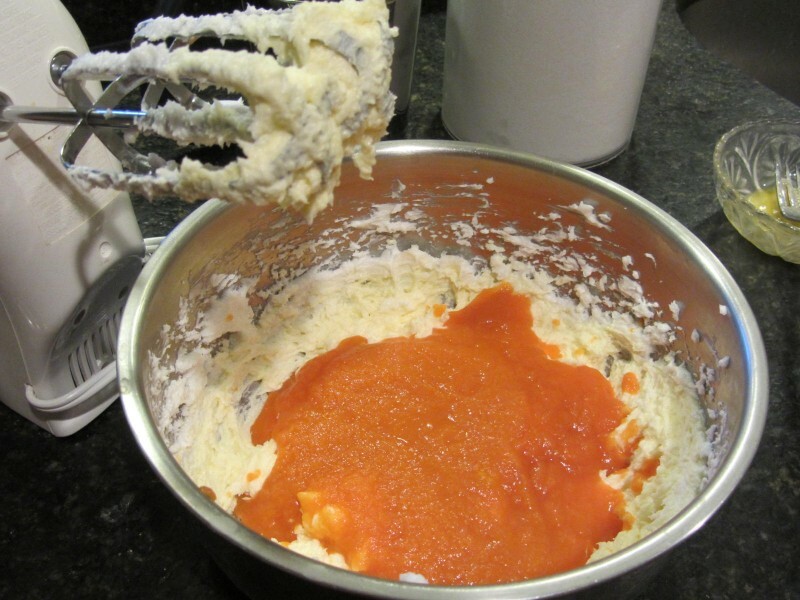 Don’t try to use fresh or frozen carrots unless you already know who to make your own baby food. Yes, you must use shortening. It won’t kill you once in a while. This recipe will puff up while baking and then flatten out as soon as you take it out of the oven. Make sure you go straight to the dinner table as soon as it comes out of the oven. While it tastes fine leftover the next day, the look and texture changes and you’ll want it piping hot from the oven for your guests. 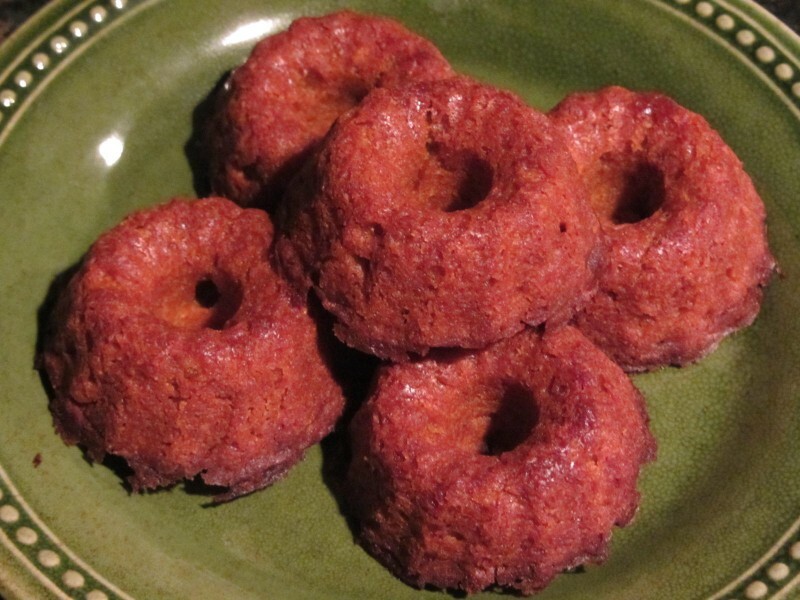 I have always used a plain ring mold for this recipe, but you can also make it in fancy muffin tins for a prettier presentation. Just reduce the cooking time…when I made these muffins, they were a bit overcooked. 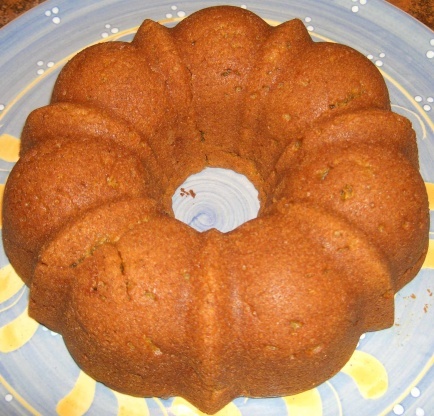 I posted this recipe on Food.com a few years ago and one of the reviewers made it in a bundt pan. It looked really pretty that way. 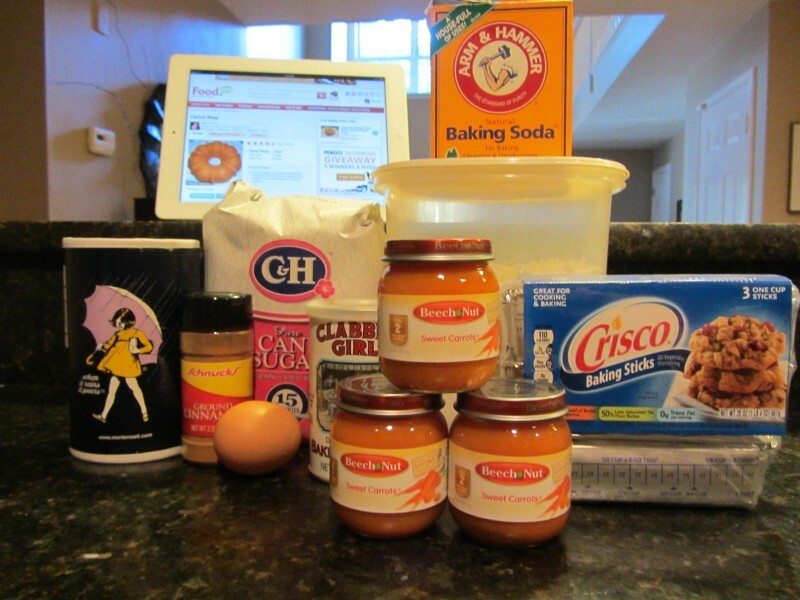 I don’t have a bundt pan and I’m not going to buy one for just this recipe since I never bake cakes. 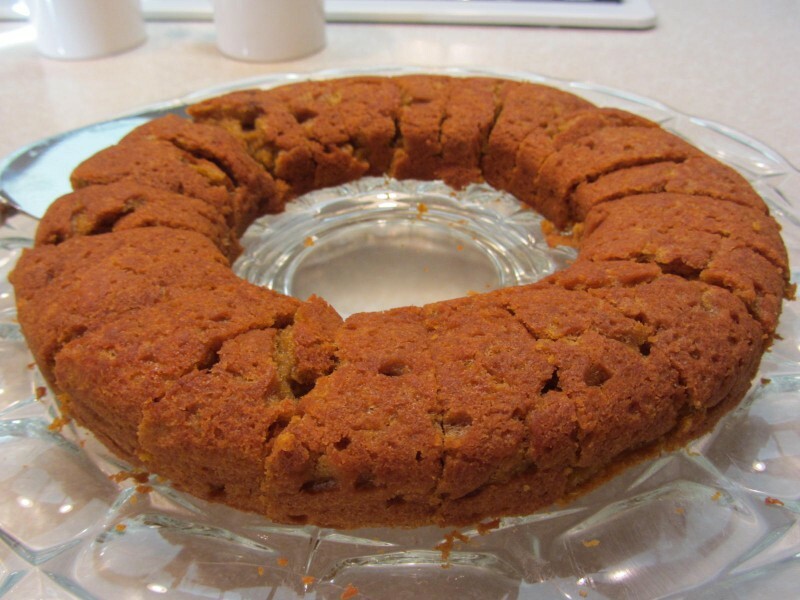 If you do make a lot of cakes, then I recommend purchasing an inexpensive bundt pan for both this recipe and your desserts. This was festive! 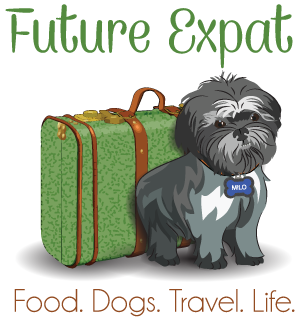 It was also very quick to prepare. Made for Make it Healthier game; since I’m an organic cook, the only changes I made is that I used organic carrot baby food, organic shortening (no trans fats), an organic egg, and organic all-purpose flour. I followed this recipe to the letter, and although I made organic substitutes, it still turned out more muffiny than soufflé, so I think the leftovers will be very appetizing tomorrow. I never thought I would be in the grocery store buying baby food. This was really good. Thanks for the recipe. I increased the cinnamon; only because I always increase any spice. This is so delicious! Even my 3 yo loved it. I used Earth Balance shortening (no trans fat) & w.w. pastry flour. So easy to make and easy to serve too. Thanks, Karen! Skip down to the bottom of this post to get the printable recipe card with nutritional information. 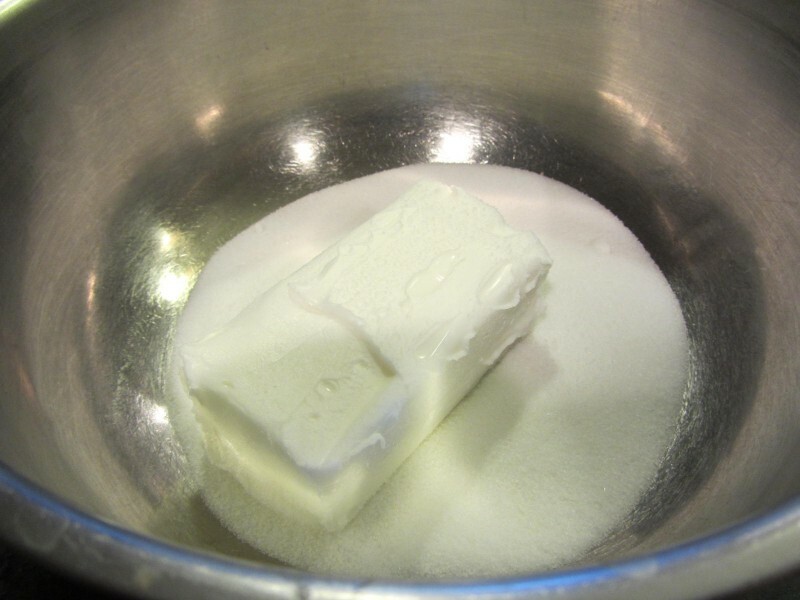 Start by putting your shortening and sugar in a large bowl. 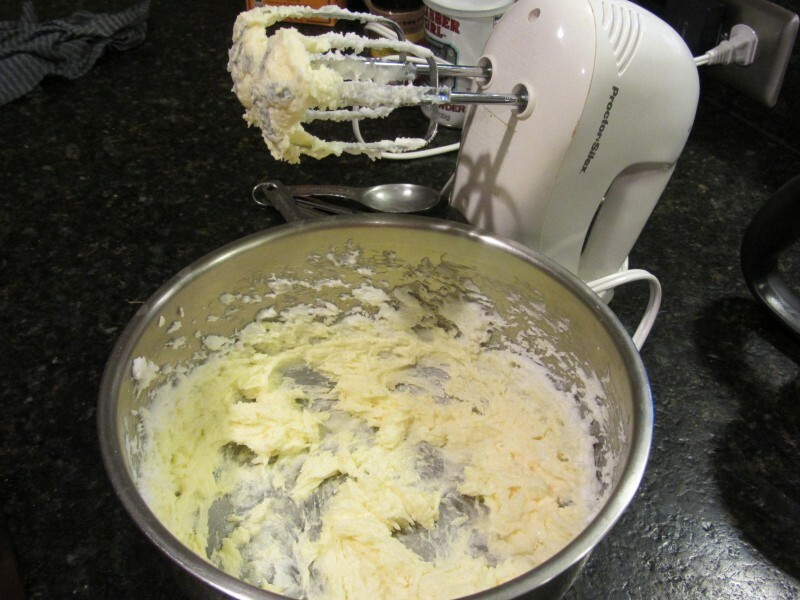 The batter is going to splatter as you mix it up…so you’ll appreciate having a bowl with steep sides if you have one. 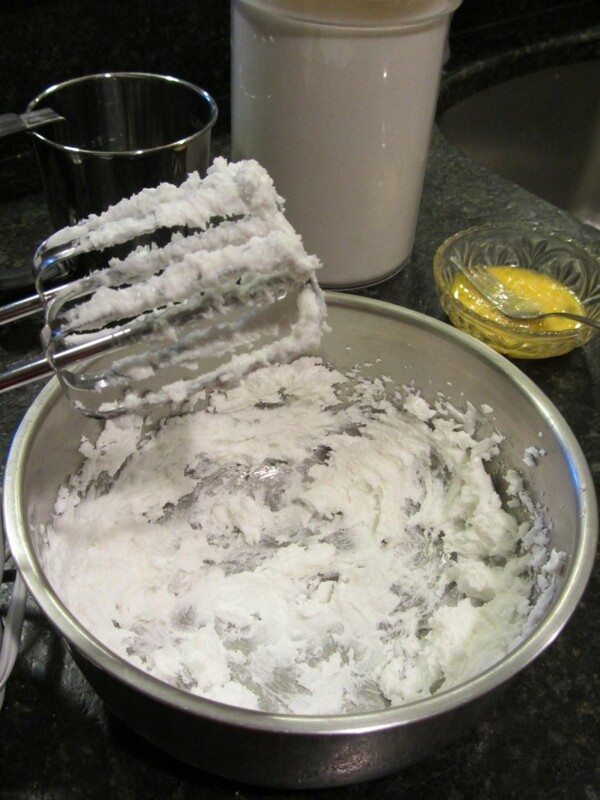 Use an electric mixer to combine the sugar and shortening, and then add the beaten egg. Next add the baby food carrots. Yes, I know this looks disgusting at this point. 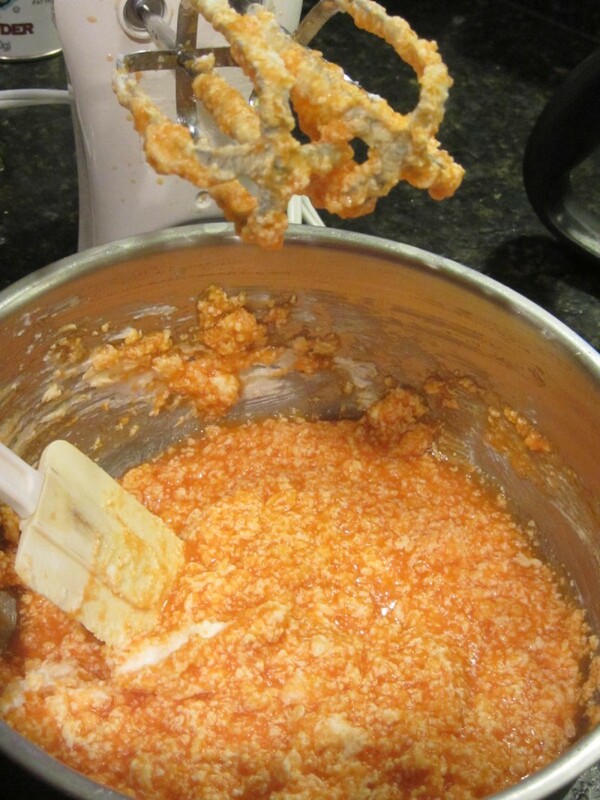 Add all of the dry ingredients to the sifter and sift everything into the bowl on top of the wet mixture. 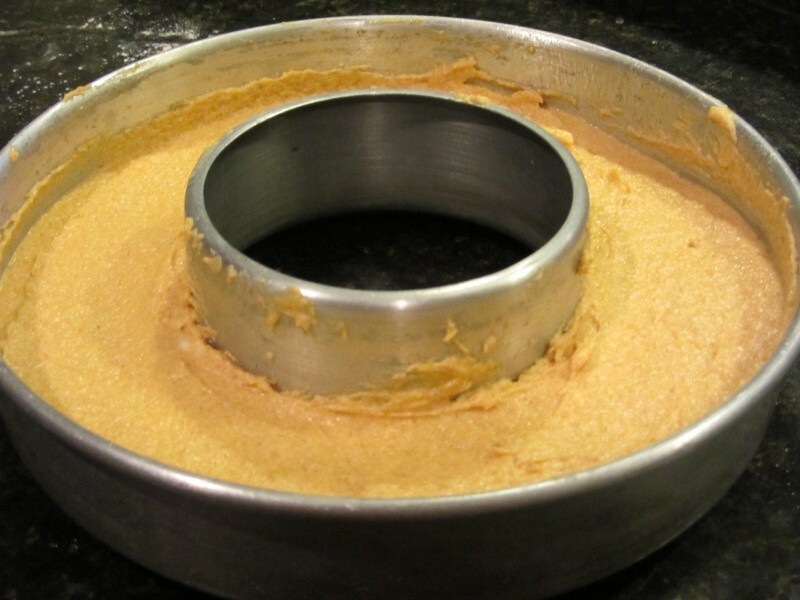 After you combine the wet and dry ingredients using your mixer, spoon the batter into a greased ring mold. Then smooth out the top with your spatula. 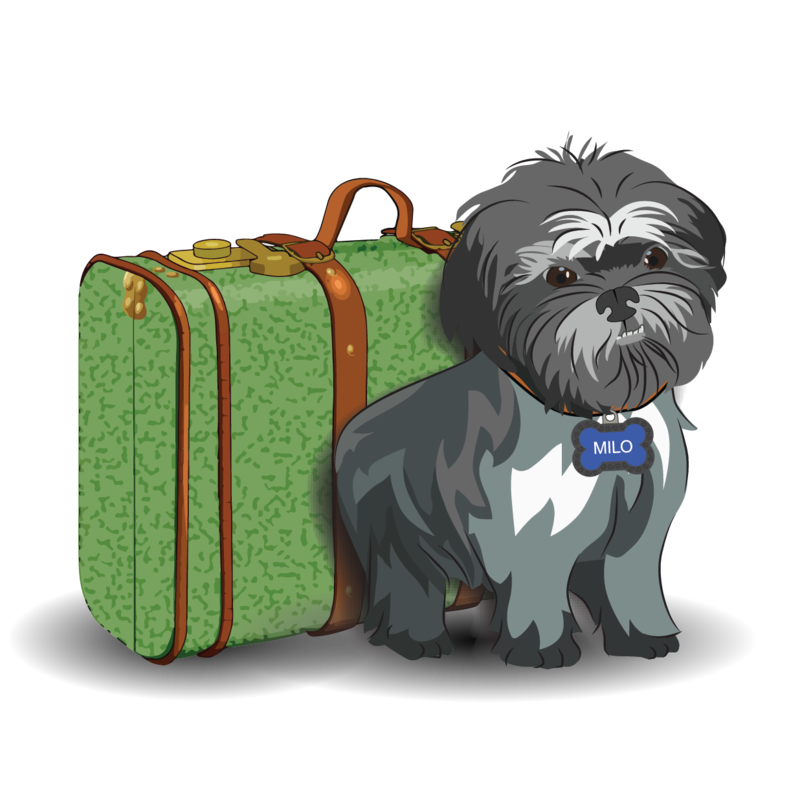 Bake for 45 minutes in an oven preheated to 375º. As soon as it is finished, place your serving plate on top of the mold and turn it over. You’ll want to wipe up the crumbs…I apparently forgot to do that before I took the picture. Slice the carrot ring using a sharp knife or it will smash down. 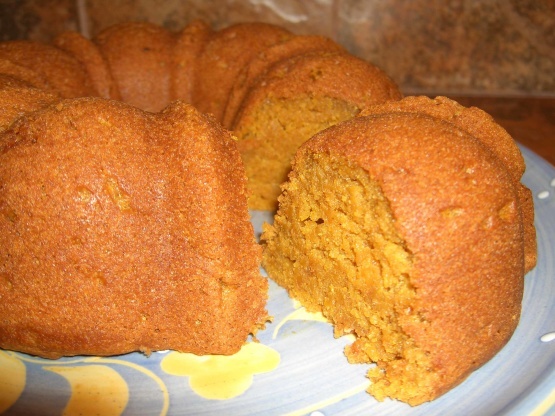 The outside gets a nice crust and the inside has a wet muffiny texture. I want to use butter…I know you say to used just use shortening but I was wondering if anyone ever told you they used butter. Also, I am going to use brown sugar. I will let you know my results. Sorry. I’ve never heard of anyone trying it with butter. Let me know how it turns out!